Posted on February 29, 2012 February 6, 2015 . by Patrick Johnstone. 2 Comments. Please excuse me while I engage in some meta-blogging. Things around here are going to change a bit. I have been blogging as “GreenNewWest” for almost two years now, but I actually started blogging before that as a way to keep in touch with friends and family back home while travelling, something I continue to do at T’N’PotR . Clearly, I didn’t put a lot of thinking into where this blog was going, or about the actual process of blogging, when I got into GreenNewWest. The choice of Blogger was make quickly, as it was free and easy. I didn’t want to waste time learning new software or interfaces, I just wanted to write. The same detailed consideration was taken in choosing the Blogs name. I literally went into Blogger, decided that no-one was going to read “Pat Johnstone.blogspot”, and that good names like “google” had already been taken. My initial intent of this blog was to talk about New Westminster, politics, and the environment from a scientific viewpoint. This made sense as, at the time, I was fully immersed in the New Westminster Environmental Partners, I was getting into my new job as an Environmental Coordinator, and I was becoming more involved in local politics. To define my politics at the time into a simple category, “Green” seemed to fit the best, and “GreenNewWest.blogspot” was available. Design a banner and Bob’s Yer Uncle. In hindsight, If I knew I was going to do this for more than a few months or weeks, or that anyone other than my Mom might read this, I might have put more thought into those initial steps, but I didn’t, so here we are. Hearing my blog name mentioned during a City Council meeting by someone who was clearly neither me nor my Mom, got me thinking: If I’m going to keep doing this thing, I gotta make it mine, no borrowed labels. Therefore a name change is in order. Why change? Part of the problem is that “Green” is one of those words that acts like baggage: makes life easier at first, people can figure out where your niche is. Eventually any niche just slows you down. The word “green” is so loaded with preconceptions and alleged linkages, that it seems to define the viewpoint before it is expressed. I didn’t vote for the Green Party last election (although I do think Elizabeth May is doing an excellent job in Ottawa, and is punching well above her weight hitting issues that the other opposition parties are missing, mostly as they stare inwards during their respective leadership races). If you mention “Green” to anyone who doesn’t immediately make the Green Party or Greenpeace association, they will think either of money (if they are over 40), or pot (if they re under 40). I also want this blog to continue to explore parts of my life here in New Westminster that are not necessarily “Green”. Even for an environmental scientist, environmental coordinator, and environmentalist like me, putting a Green spin on every story gets tiresome. Sometimes, I just want to talk about my back yard. “NIMBY” is a term commonly used to describe many environmental arguments, an acronym for “Not In My Back Yard”. Like scare tactics based on complex conspiracy theories and logical fallacies, the NIMBY approach to environmental issues is one I try strenuously to avoid. Some local issues such as the United Boulevard Extension and the burning of Metro Vancouver trash can easily fall into NIMBYism, but I have always tried to make it clear that what is good for my gander is good for others’ geese. Moving the Metro Vancouver incinerator to Crofton does not end my opposition to the idea of burning trash for profit. It is precisely other municipalities’ successes with limiting the growth of automobiledom that encouraged us to say no to UBE, and in the end, I wanted to see the UBE money spent on real, sustainable transportation improvements (like Evergreen, or Rails for the Valley) even if they are not in New Westminster. I am a lot of things, many of them irrational, but a Nimby I’m not. Ultimately, New Westminster is my back yard, but so is BC, from the Gulf Islands where my In-laws live to the Kootenays where my Parents live – I spend a lot of time in both places. And I like to travel to futerher off areas. I also recognize that everything I do in my literal back yard – that 1,500 square feet where my compost and my green cone and my fig tree and my carport are – impacts the City, the Province, the Country and the World, just as the rest of the world impacts my back yard. This is why we “act locally and think globally”. Clearly, I am no internet whizz, so hopefully, if you go to GreenNewWest it will prompt you to come here instead. I moved all of the GNW archive over here, so you can still scroll through and search the horror of my past, but of course links and such probably get screwed up, and your links will probably need updating. Maybe a year from now, if I’m still here, that won’t be such a problem, but until then, thanks off the patience, and update your links. All Pattullo, all the time. Posted on February 28, 2012 February 6, 2015 . by Patrick Johnstone. 1 Comment. I missed my first NWEP meeting in a couple of years to attend the TransLink Pattullo Bridge consultations in Surrey. I stepped back and did not take part in the “consultation” part (TransLink got a page full of notes from me at the New West meetings, let them hear from someone else for a change), I really just wanted to see how the other half lived, and get a sense of what the mood is on the Surrey side of the River. Exposing my cultural biases, I walked into the meeting assuming that people in Surrey were all for the bridge, and the bigger and more toll-free, the better (which seems to be the position of their Mayor). Instead, I found there was a lot of diversity of opinion in the room. Admittedly, there was more discussion of getting rid of traffic lights in favour of onramps and overpasses in Surrey that I heard in any New Westminster meeting, but there were still a lot of people concerned about the need for the bridge, and the impacts on their community of yet another major highway expansion. Perhaps this should not be surprising, as these people are currently watching the installation of South Fraser Perimeter Road in their neighbourhood – highway expansion is not a hypothetical to them. One of the issues I heard a lot of (that was new to me) was the encroachment of industrial and commercial development in the Bridgeview Neighbourhood. There are a lot if single-family homes in the area between King George Highway and the new South Fraser Perimeter Road, and the residents are feeling squeezed by the commercial properties along King George, the industrial lands to the east and west, and the new truck route to the north. One resident of 124th was concerned that the proposed expansion of 124th to accommodate truck traffic linking the SFPR to King George was going to bring trucks through the middle of this neighbourhood, and within 20 feet of his house. His house is built on “60 feet of peat bog”, and every time a truck drives by now “I get shaken from one side of the sofa to the other”. Naturally, goods movement through his front yard does not seem like a good idea to him. For many Bridgeview residents, the “Upstream” vs. “Downstream” question, which I kind of made fun of for the New Westminster side as an example of a completely irrelevant question, is not at all irrelevant. Downstream means the bridge will extend over a small area of waterfront park space (a limited, and therefore valuable, commodity in Bridgeview), but the Upstream option will move the elevated parts of the bridge closer to their homes, potentially increasing noise and view impacts. Another thing I learned is that TransLink is actually listening. Many of the issues raised by residents in the first consultation in New Westminster two weeks ago are now being brought up by TransLink during the introductory discussions. This has even resulted in more complete answers being provided to address some of the uncertainties I raised in my earlier posts about this project. And example is more detailed explanation of the 6-lane bridge decision. Frankly, I still think the “increased safety” argument is a red herring, but the argument for 6-lanes is more fleshed out now with discussion of the business case made back in 2008, and subsequent reviews of the business case. It would be great if the metrics of those analyses were available on the consultation page. Especially as I heard one interesting discussion at this event about how the value of the existing bridge was assessed. I had something like this question bouncing in my head recently, but I didn’t know how to frame it. Luckily, one of the participants in Surrey was very eloquent on the idea (more than I will be in this paragraph): what about the social and economic value of the existing bridge? Like it or not, the Pattullo is an iconic structure, a steel arch-span bridge similar in age, height and length to the Sydney Harbour Bridge (though less than half as wide). It’s arch has loomed over New Westminster for 75 years: the same age as the Lions Gate Bridge and the Columbia Theatre – two structures of which no-one would argue the heritage value. Surely this has a socio-economic value to the City, and to the region. If Translink wants to replace it with another dull, cookie-cutter, concrete cable-stayed bridge built by the lowest bidder, what value is lost? 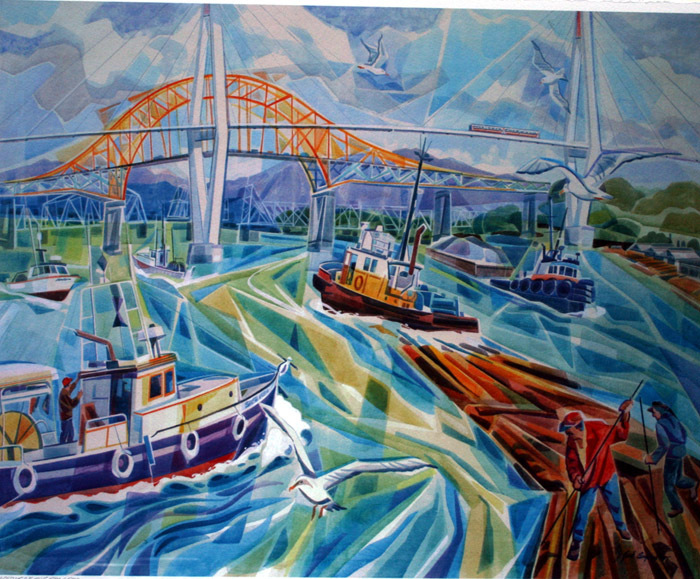 Honestly, I don’t know how we estimate that value (or if we can), but this is a question that a City that prides itself on its Heritage Values needs to address: What will New Westminster look like without the Pattullo?
? Another interesting question was raised by one of the participants at the tables rising from the data provided by TransLink. If the daily truck volume is 3,000 and the daily vehicle volume is 60,000, then less than 5% of the volume is actually trucks. 20 cars per truck. So why are we building a 24-hour dedicated truck lane each way? How much do we anticipate truck volumes growing? 3,000 a day is only 1 or 2 each way per minute. This seems like a lot of extra money for very few trucks. Or more frightening, does TransLink think the increase in trucks will be much, much larger? What impact will this have on New Wesmtinster? Maybe I am getting mired in the details too much, and am missing the fundamental point here; and if so, perhaps TransLink is doing the same thing. At all of these consultations, I have had friendly chats with TransLink Roads and PR staff, the consultation team from HB Lanarc Golder, and the representatives from the engineering firm that provided the conceptual design work. All of them say the same thing: we need to build a bigger bridge because traffic volumes are going up. Some people in the room disagree with this (as do, apparently, some members of New Westminster Council). So perhaps TransLink should not have sent their roads guys to come and consult with the City of New West on the topic of offramp shapes, but should have sent the Policy Guys to come and discuss the need for a bridge. Perhaps the fundamental question we need answered is this: What is Translink’s Mandate? Is it to create the transportation system that people want, or that Kevin Falcon wants? Or is it to set transportation policy for the region? I always thought the latter, but the Act seems to suggest they carry both responsibilities. If so, shouldn’t the Policy part come before the building part? TransLink’s policy document right now is Transport 2040. So before they send people to New Wesmtinster and Surrey to talk about offramps, they should come to our communities and have a discussion about how Transport 2040 fits our local conditions. Then we can talk about the type of bridge to build. As it is, building an expanded road bridge while Surrey and the Broadway Corridor wait for their long-promised mass transit investments seems to be a demonstration of a policy very diffrent than laid out in Transport 2040. Posted on February 26, 2012 February 6, 2015 . by Patrick Johnstone. 2 Comments. As part of the AAAS meeting in Vancouver last week, Dr. Michael Mann gave a talk for the Pacific Institute for Climate Solutions. Not this Michael Mann , but this one. You could Wiki this, but the short Bio is thus: Dr. Mann is a geophysicist and geologist who worked with a team of scientists who used a variety of proxy climate indicators (tree rings, coral growth patterns, ice cores, stalactite layers, etc.) to measure climate over the last 1000+ years. 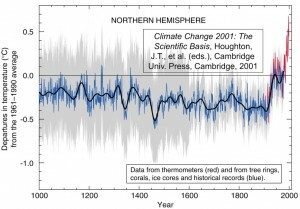 turns out the graph showed a sharp rise in temperatures in the Northern Hemisphere over the last 100 years. The graph was compelling enough, and the data robust enough, that I was included in the UN’s International Panel on Climate Change Third Assessment report. Around that time, one of Mann’s co-workers used the expression “hockey stick” to describe the curve on the graph, borrowing the nickname from an older graph of atmospheric Ozone made by other scientists 20 years ago during another global atmospheric debate. The graph was such a stark image, displaying our current situation in such clear terms, that is simply could not be left unaddressed by those who see Anthropogenic Climate Change as some sort of conspiracy. Included in those people are several Canadians: Steve McIntyre ( a retired mining engineer) and Ross McKitrick (an economist) tried their hand at Climate Science and wrote a paper in a a fake science journal claiming the graph was the product of flawed science, and the battle for “Mann’s Hockey Stick” was on. From the beginning of his talk, it is clear Dr. Mann is exactly what you would expect: a science geek, and a reluctant public figure. His speech was not polished or slick, the images not particularly compelling to a non-science audience, but it was an entertaining talk about how one guy doing proxy climate measurements can somehow become an enemy to some, just because he collected a little data on a topic that would become a political football. In the last 10 years, this PhD Geologist who spends most of his time counting tree rings and teaching Earth Systems Science at Penn State, has had his e-mails stolen and publicized, Has been summoned to congressional hearings, investigated by his State Attorney General, been subject to academic kangaroo courts at his university, and accused of everything from perpetuating the “greatest hoax in the history of science” to outright fraud. Numerous investigations later, no-one has found any evidence of fraud or scientific misconduct. 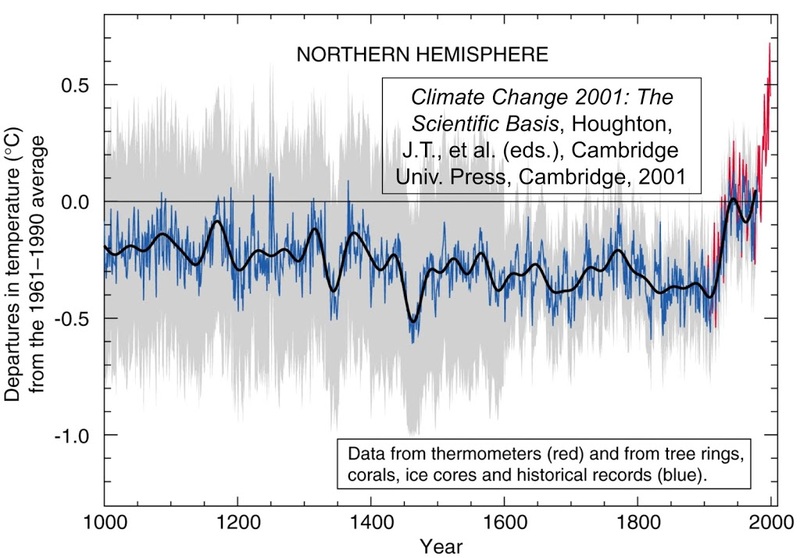 But that doesn’t even matter, because one thing none of the people criticizing the “hockey stick” have done is collect any data that refutes it. They have instead spent so much energy and time trying to cast doubt on the veracity of the “hockey stick” that they have failed to acknowledge that there is an entire hockey league of sticks that are the same shape: measured atmospheric anthropogenic CO2, sea level change, ice extent, ocean temperatures, the list goes on. In the end, Michael Mann is still a reluctant public figure (partly evidenced by his reluctance to take legal action against the people slandering him: he would rather just do science and find solutions). All he can do is keep reporting what he and other people doing the actual science have found. The scientific case is relatively straightforward; the greenhouse effect has been known for two centuries; we know human CO2 numbers are going up, and we know it is anthropogenic; we know earth has warmed more than 1 degree C over the last 100 years,and the trend is up. if you choose to ignore the thermometers, there are literally dozens of other lines of evidence: surface temps, permafrost loss, ocean stratification, and numerous observed biophysical reactions consistent with rapid warming. combine this with a distinct paucity of evidence against the trend, and it is remarkable anyone is still debating this. The final point was one I have heard a lot recently: this is no longer a scientific debate, it is an ethical one. We need to make the ethical decision of whether we will burden the next generation and the one after with the unforeseen consequences of what we are doing today in the interest of Business as usual”. However, that’s s not a scientific question, it is a philosophical one. Once science has provided the data, what you do with it is not up to the Scientists. 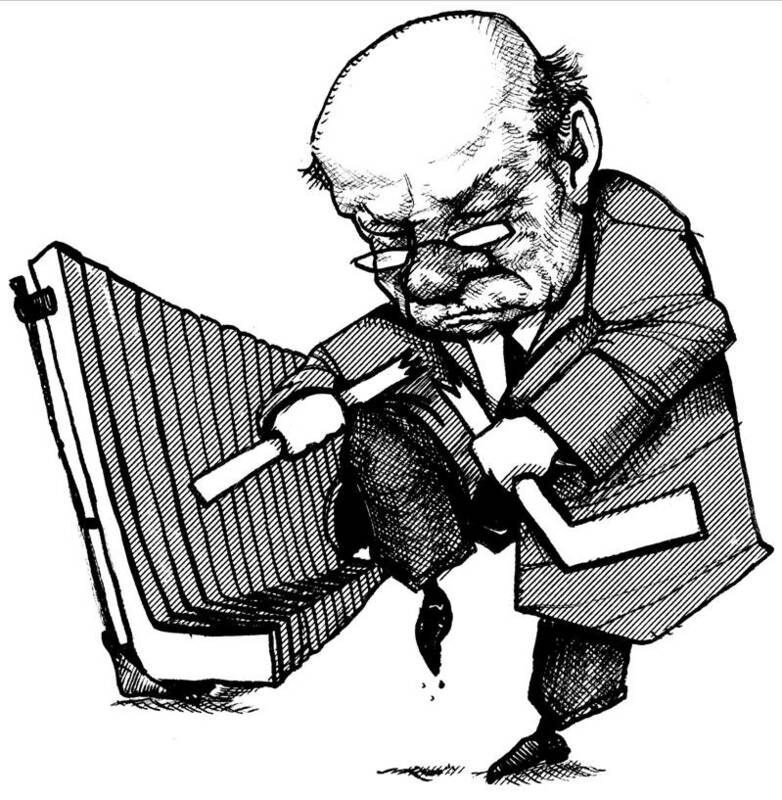 Mann was quick to point out that the issue is not, as some suggest, the “politicization of science” (inherently, science is immune from politics, as its self-regulating mechanism will win out in the end), but the “science-ization” of politics, where a political position or immediate pragmatic need of a political group is mistaken for a scientific fact. To beat this, we may need more reluctant scientists like Mann to take a more active part in the popular media, and provide the factual information we need to make rational decisions, informed by our ethics. It’s the best hope we have to get past this strange, anti-science phase we are in right now in North American society. Posted on February 25, 2012 February 6, 2015 . by Patrick Johnstone. Leave a comment. Having attended both New Westminster workshops on the Pattullo Bridge Replacement being held by TransLink, and being on the Master Transportation Planning (MTP) committee for the City, I noticed there is a o lot of misunderstanding about what the City’s position is on the TransLink process, and how the City’s MTP process fits into that. Big caveat here: I am but one member of the Master Transportation Planning committee, representing the Advisory Committee on Transit, Bicycles and Pedestrians. The MTP committee has 20+ members from various City committees and outside agencies, and is only one part of the entire MTP process, being run by City Staff and outside consultants, under direction from Council. Therefore, nothing I say here is in any way the official position of the MTP committee, City staff or Council, or anyone else other than me. It is, however, based on what I have heard said at various official meetings and unofficial conversations with staff and council. At the TransLink meeting at the Quay on Thursday, I talked to School Board members and several other people in the community who are usually very much in the know, and I found myself trying to explain what the relationship between the MTP and the Pattullo Bridge consultation is. Unfortunately, it has been cast a bit in the media that New West is once again being obstructionist, engaging in Nimbyism, refusing to take part, and being generally petulant spoilt brats. This despite the attempts by City Council and TransLink to broadcast that this is not the case. I don’t see New Westminster missing the boat at all here, but I see the City taking a pragmatic, responsible and measured approach. The first thing you need to keep in mind is that this round of consultations on the Pattullo is the first round of a very long process. TransLink will be taking the results of this consultation (preliminary design characteristics) and then entering an “operation analysis” phase. The preferred design out of this process will be tested at both ends for everything from how it manages traffic flows, how it fits the existing traffic patterns, how bikes and pedestrians will be accommodated, etc., etc. TransLink will also start the (potentially lengthy) joint Provincial and Federal Environmental Assessment process. Both of these steps will include significant public consultation and discussion. Then they will have to deal with the financing model, hiring a concessionaire, negotiating land swaps, etc. Even after this initial consultation, TransLink is at least 4 years from any shovels getting into any ground, and at least 3 before we know whose shovels it will be, and where they want to put them. In other words: there is no rush to provide all the answers right now. 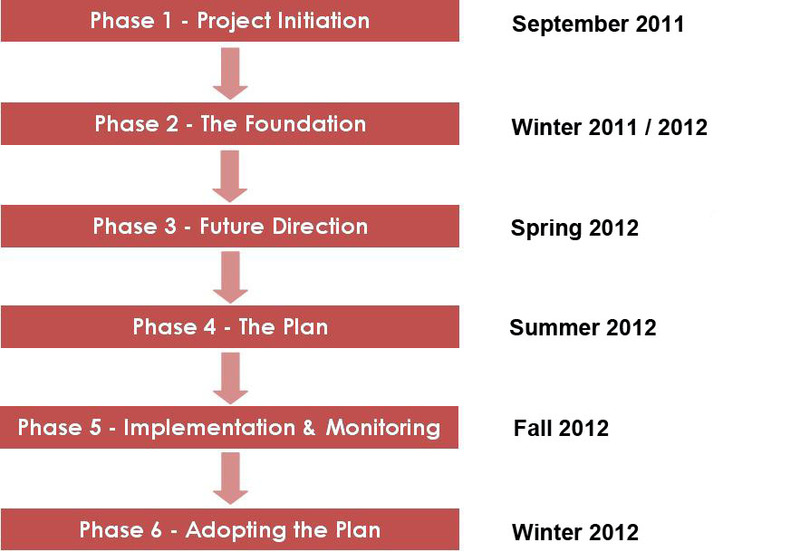 The City is currently completing Phase 2 (information gathering) and is about to embark on Phase 3. That is the phase where the City looks at where it is today, transportation infrastructure-wise, and determines what the Goals, Values, Objectives are for the coming decade or two. 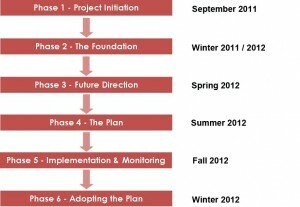 It is the big “visioning stage”. In a couple of months, after some public and stakeholder meetings, and likely workshops, the City will come up with a set of Values and Goals that define what type of transportation infrastructure the community wants to see in the foreseeable future (and in this case, by “the community”, I mean the residents, the businesses, the staff and the elected officials; everyone involved in the MTP process). Then, when those Values and Goals are determined and formalized, the City will be in a position to approach TransLink and say: “Here you go. Make your plans address this”. I don’t think there is yet a concrete idea of how that discussion will take place: will there be public consultations? Will the City report out to TransLink or do a joint consultation and reporting? No idea., but the point is that the City will take a bit of time right now to get a better understanding of that the community of New Westminster wants in a transportation system, then they will be armed with that knowledge when they go into negotiations with TransLink on how the bridge they want to build fits those parameters – or if it can even be made to fit them. In the meantime, TransLink will be continuing to work on their process, but New Westminster will not be missing any boats here. We will be through that Phase 3 work in only a few months, TransLink will not likely have any operational plans in place for a year. When the MTP is at a point where useful data is available for TransLink, TransLink will be in about the same position as they are now. More importantly, TransLink knows and understands that this is the route the City wants to take, and seems to respect that decision. So, if you really want to influence the Pattullo Bridge design? My advice is to get involved in the Master Transportation Plan process. Come to the meetings, attend the workshops, follow on-line, and provide your input at every opportunity. Posted on February 22, 2012 February 6, 2015 . by Patrick Johnstone. 1 Comment. First off, you think TransLink would learn their lesson. 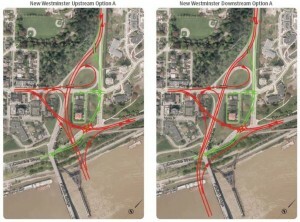 During their last foray to New Westminster to consult on highway expansion, the turnout was at first completely overwhelming, then Standing Room Only in the subsequent hastily-assembled 4- or 5-step consultation proccess. This month’s public open houses for the City’s Master Transportation Plan had a higher turnout than the consultants have ever seen at a similar event, more than 100 people each for the first phases of what, for most sities, is a dull planning document. The Lesson? Have a public meeting about Transportation issues in New Westminster, and people are going to show up! There is no excuse for having too small a room and not enough chairs for the participants. I’m not going to talk too much about what Translink discussed at the Workshop at Centennial Centre on Tuesday. Daniel at City Caucus sums up the spirit of the room pretty well, and we were not really offered any info that isn’t available on the TransLink website for the consultation. Instead I am going to talk about what wasn’t discussed at the meeting, and why that is a problem. All of the designs deal with on ramps the same way, but I’ll use this one as an example, because it is first alphabetically. Say you are Dave the Truckdriver entering New Westminster from Surrey, over there in the rightmost lane. If you want to go east to Highway 1, you take the first offramp, if you want to go towards the Queensborough, you take the second offramp, if you want to continue north towards Burnaby, you stay on the main route to McBride. All are options, as all are on the Major Road Network and designated as Truck Routes. It is unclear where the main route changes from three to two lanes, but it is presumably at the first or the second offramp. If it is the first, then you will need to change lanes before then (unless that is your destination). If it is at the second, you will still need to change lanes before that. Trucks going North will always need to change lanes. So lane changing is inevitable unless all trucks are forced to a single offramp going in one direction, but that would significantly reduce the usefulness of the bridge for “Goods Movement”, wouldn’t it. The same situation happens for trucks heading south down McBride onto the bridge, or entering the on-ramps from the other roads, they are either going to have to change lanes to get to the outside lane, or merge onto the outside lane, and there will be inevitable mixing with cars. Oh, and cars using any of the offramps will of course need to move into the lane with the trucks in it, presuming the exit ramps are all on the outside lane. It is inevitable that cars and trucks will need to move lanes, and will need to at some point share lanes. Mixing of cars and trucks in inevitable. This is the important part: These inevitabilities do not change at all between a 6-lane or 4- lane structure. The argument that a 6-lane bridge is “safer” is a complete wash. The second point that was not discussed was the bigger picture around how we will manage the extra traffic once it exits the off-ramps of the bridge. 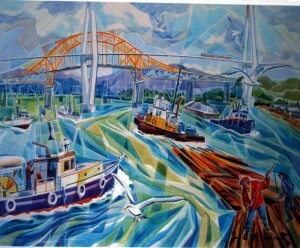 TransLink pointed out one of the arguments against locating the bridge in another location (such as upstream at Sapperton Bar, downstream at the Tree Island location) was the integration with the existing road network. However, the current road network on the New West side is built to accommodate a 4-lane bridge, and already fails at times to accommodate that traffic load. Increasing the bridge by two more lanes will increase traffic capacity at the City boundary by 50%,. Currently, there is no plan to accommodate that. Think McBride is backed up northbound now? Think Brunette and Braid is an issue today? Think the Stewardson-to- Queensborough connection is a mess today? How will increasing traffic 50% to these locations help? This is unfortunately and eerily like the UBE discussion again. Tranklink responded to this saying: we’ll design the bridge first, then figure that out. Not surprisingly, few people in the room were satisfied with that answer. That answer shouldn’t be acceptable to anyone in the region who is funding TransLink; even those that believe building roads can solve traffic problems. TransLink wants to spend a Billion of your dollars to move a traffic pinch point 100m up the road. This is an example of a build-then-plan mentality that has them currently building a $4 Billion 10-lane Port Mann Bridge / Highway 1 Widening Project and a $1 Billion South Fraser Perimeter Road project, two major new Goods Movement routes that actually cross each other but do not intersect, forcing trucks to drive through New Westminster to get between them. Oh, and that Billion dollars? That was the third topic not discussed. According to Translink, there is currently no funding source for the bridge. They are therefore presuming that it will be funded by tolls, likely through a design-build-operate concessionaire, much like the other 16 lanes of Fraser River crossing traffic that have been built in the last decade. They won’t say it is tolled, but they won’t say if there are any other sources. This creates another area of uncertainty that needs to be addressed before we go any further. The BC Liberals have, as few as two weeks ago in that strange radio-interview-mini-throne-speech-event, suggested they are against tolling. The Mayor of Surrey doesn’t like tolls for this bridge. However, the senior governments are not lining up to dump a billion dollars on TransLink, and TransLink can’t raise taxes. So how are we paying for this thing? TransLink says let’s design it, and get approvals, and the money will arrive. One significant problem with this, of course, is that we cannot establish the business case or the demand for the bridge without knowing if it will be tolled. TransLink representatives after the meeting admitted their estimates for future traffic demand on the bridge are based on tolls being collected. They provided some demand estimates based on population growth: increased vehicles from 60,300 today to 94,800 in 2041, but didn’t make clear in the presentation part that these estimates are based on a 6-lane, tolled bridge. How do these estimates change if we build a 4-lane bridge? Or if we don’t toll? Or if this same $1 Billion is invested in rails and/or SkyTrain for Surrey and Langley? Or are we, once again, just going to build it, then plan? We have learned from the Golden Ears bridge example that tolls are effective Transportation Demand Management tools. People have avoided paying them, by driving around the long way or by reducing the number of trips. We have also learned from the Golden Ears that traffic estimates for tolled bridges can be overly optimistic (not the same story for new rapid transit infrastructure). So without demonstrating the need for increased lanes, without explaining how these increased lanes will be accommodated on our already crowded and built-out streets, and without telling us how the bridge will be paid for, TransLink has taken to time to ask us which side of the old bridge we would prefer the new ramps? Sorry TransLink. For some reason, the people of New Westminster are not feeling like they are “Part of the Plan”. Posted on February 21, 2012 February 6, 2015 . by Patrick Johnstone. 5 Comments. It is not going to surprise any CBC Radio1 listener if I admit to being a firm Anti-Cluff-ite. Rick Cluff is the morning show host in Vancouver on the Flagship Mothership, and comes to us after a long history of sportscasting in southern Ontario. This explains why the only thing he approaches with any intelligence or enthusiasm is sports. When talking to the Sports Guy in Toronto (whoever that is this week), he is in his element. And food; he seems to really be into talking about food. For pretty much any other topic, he is hopeless. In this morning’s conversation , the conflict narrative was New Westminster being a roadblock to replacing the aged Pattullo. Sany Zein tried to clarify and explain that New Westminster was in the middle of their Master Transportation Plan and that the two consultations would work in parallel, and together. There is no conflict there. Then he has a canned input from Wayne Wright saying the same thing, followed by Mr. Zein repeating it, but Rick kept on narrative- How can they move forward with New Westminster being so uncooperative? It was painful. The worst part is that Rick’s blind devotion to the conflict he wrote down on his crib sheet kept him from asking questions most of his listeners wanted to have answered. How big will this bridge be? Who is going to pay for it? Will it be tolled? How can the public get involved in the consultations? You know, useful information that the news could provide, instead of trying to find a simple conflict narrative to attach sports metaphors to. Contrast this to Stephen Quinn’s interview approach, where he carries on a conversation, responds to the previous answer, and prepares himself ahead of time so that he can follow the conversation wherever it leads. He also has a knack for fitting in that one slightly uncomfortable question that the public wants to hear answered. Quinn is clearly the best interview talent on the local CBC. Yet again, I digress. In the case of this morning’s interview, Rick Cluff continues his trend of seeing the world through a windshield. He is of the generation that thinks you can solve traffic problems by putting more roads down, which is a frankly ridiculous approach in the year 2012. This might be because he drives in from White Rock at 4:30 am when the roads are empty, then listens to the traffic reports all day and can’t imagine the cars are the problem. Regardless, Sany Zein is, in my experience, an approachable and thoughtful guy. So you should feel comfortable asking him questions directly during the open houses coming up this week. Starting tonight! Posted on February 19, 2012 February 6, 2015 . by Patrick Johnstone. Leave a comment. I haven’t written about my Green Cone in a while. You want to know why? Because like most things that simply work, it is almost completely unremarkable. I started blogging here a couple of years ago, not too long before I first got a Green Cone. I rambled on after that about installing it, initial concerns, and finally finding the groove. I only bring it up again because last week the annual Solid Waste Report for the City was reported to Council, and according to the numbers for 2011, diversion rates are up. Way up. It occurred to me that I contributed 0% to that increased diversion. In fact, I might have been responsible for a small reduction of the overall number. You see, diversion is the measure of how much curbside trash goes to recycling as opposed to the landfill (or incinerator, more on this later). The City’s diversion rate has gone from 31% to 59% between 2009 and 2011, almost completely because much of what used to go to landfill now goes into the Green bins, and is “diverted” from landfilling. This is a remarkable number, 59%, proof that a lot of people are using the green bins. the best part is, although we are currently not seeing the savings (we are managing the costs related to the shift in systems), we are going to save a lot of tax dollars in the long run. That said, I really don’t use my Green Bin. Since before they arrived, I have been putting my vegetative compostables into a compost bin and using it for fertilizer on my garden, and have taken the nastier organics in my trash (essentially, anything that stinks) and put it in my green cone. Add this to blue bin box recycling, and we really don’t throw much out. We take our 120L trash bin to the curb less than once a month (Really, its is all about the laziness… I hate getting up to take out trash in the morning). in the green bin? A few twigs from annual pruning, and a few gardening weeds I don’t want in my compost. However, much of that actual “diversion” I do at home does not show up in the City’s or Metro Vancouver’s statistics, because none of that waste ever gets to the curb. Actually, since getting a Green Cone, our measured diversion rates as a percentage of our trash has likely gone down somewhat. So we are saving even more tax dollars. As for the new blue bins for “commingled recycling”, I have railed on about these in the past. The thing is freaking huge, and I just can’t get over the idea that they are somehow going to make people recycle more because they now don’t have a separate bag for paper. We are going to have to wait until next year’s report to see if this proves true. I am hoping that next year’s report will also include some discussion of where the commingled recycling material is going: how much of it is recycled, how much is “bypass”, and how much is incinerated. If it is going they way I suspect it is, and the way it has commonly gone in other jurisdictions where commingling has replaced separated containers and paper, then the best strategy for those who actually want to reduce their solid waste generation will be to take paper to the recycling yard, where we can be more confident it is being recycled and not burned. Oh, the Green Cone? It works great. I have a little counter-top bin to collect things that I don’t want to go in the compost (bones, meat, fish, cheese, gravy, etc) and every couple of days I dump them in the cone. I have not had to add any of the bacterial starter for more than a year, everything down there looks appropriately grey and fuzzy, and there is no noticeable smell. The cone seems to be at some sort of equilibrium where I keep adding stuff and the pile stays the same size… Must have something to do with Dark Matter or other mysterious forces… The worst thing that happened this year is my little counter-top bin started to smell a bit. Turns out something funky got into the fabric fly filter in the top. I popped it out, soaked it a few hours in baking soda, then threw it in the dishwasher. Good as new. Posted on February 17, 2012 February 6, 2015 . by Patrick Johnstone. 5 Comments. OK, I’m back. EMAofBC Workshop event went well. Thanks for asking! Hector Bremner has been all over the local media recently. I have met him briefly a few times, and he seems like a nice guy. We disagree on a few things (most notably, our differing opinions on the leadership qualities of Premier McSparkles™), but ultimately, I think his heart is in the right place. I did like reading his recent comments in the NewsLeader regarding the Pattullo Bridge proposals that have been snuck out to a few “stakeholders” for comment before the great unwashed get to opine. It sounds like the 6-lane option for the bridge has been favoured, without real justification for expanding capacity at this time, nor for managing how a 50% increase in traffic capacity at one point in our City is going to help a City already congested with too much through-traffic. Setting aside two lanes for trucks sounds useful for “goods movement”, but in reality, you are just removing the trucks from the other two lanes, and making more room for cars. Then the increased number of trucks and cars are going to have to jam together again at the now-worse choke points on the north side of the river. It is implied in the NewsLeader article that a 6-lane bridge will be “safer”, and here is where we see the creative messaging starting to appear. The danger on the Pattullo has always been excessive speed, usually late at night when the bridge was underutilized. I’m not sure how turning it into a wide, mostly empty, 6-lane speedway after midnight will improve safety. The greatest thing ever done to improve safety on the Pattullo was to reduce the number of lanes at night. Somehow, going the opposite way will now help? A 4-lane Pattullo can be as safe as a 6-lane Pattullo, and no Pattullo may be the safest option of all. So much for the safety argument. The second part of Hector’s discussions I don’t quite follow. I agree that we should not be making major investments into infrastructure until we have a longer-term plan based on identified goals, however he (or the editing) makes it sound like those sorts of plans don’t already exist, when clearly they do. The broader regional transportation plan is called Transport 2040. The City has an existing Master Transportation Plan, upon which the next one will be built. There is also a Regional Growth Strategy , and his own favorite BC Liberal Government has a Climate Action Plan. All of these say the same thing: we need to stop building space for cars, because that will not solve any of the problems we are trying to solve, and start making it easier to take the alternatives: public transit or active transportation. The plans are there, were created locally and regionally, with political blessing and public input, they are all their laid out on paper. All we have to do now is build the infrastructure we were planning to build, not the infrastructure that is momentarily convenient to build. Because no-one likes to see infrastructure money wasted on making a problem worse (cough*cough*Queensborough bridge*cough). I definitely don’t agree with the criticism that is implied about the Public Consultations that TransLink ran for the UBE. I think (after the false start forever known as the Donnybrook Conference) they did an excellent job of making themselves available to the public, of balancing the talking and the listening. I think they gave a solid effort to make something work that addressed the local concerns. When they could not come up with that solution through consultation, they “put their pencils down”, which was the honest thing to do. It would have been easy for them, with the political pressure on them from several fronts, to railroad that overpass through (pun intended), but they didn’t. They were true to their consultation model, and TransLink deserve praise for that, not criticism. Anyway, it was good to see Hector, (who is currently the closest thing we have to a BC Liberal Insider in New Westminster, yet he seems enigmatically logical), critical of how this road expansion will impact New Westminster. What I haven’t heard from him, or anyone else, is how our current traffic system will be negatively affected when tolls begin on the Port Mann and the existing Pattullo becomes the preferred route from Central Surrey. The party he wants to represent in New Westminster has made it pretty clear that they will not tolerate tolls on this bridge, existing or replacement. That raises another unadressed question: where is this $1 Billion going to come from? If not tolls, then where? Translink is nearly destitute, and even the Pattullo Expansion’s biggest fan, the Mayor of Surrey, is clamouring for whatever spare cash they have lying around to be spent improving public transit in her under-serviced City. The Fed largesse is clearly running out. That pretty much leaves the BC Government, who at this point is happy to muck about unaccountably in TransLink finances, but wash their hands of the negative economics of that mucking about. If this bridge is in immediate peril of collapse, then let’s plan for the most affordable, practical replacement that fits our needs: a 4-lane structure using the same major intersection architecture at each end. The net impact on the neighbouring communities will be minimized, and we can save $300 Million or so just by building a lean, mean 4-lane bridge. Let’s re-invest those savings in the modern, practical and efficient infrastructure that South-of-the-Fraser needs to reduce their dependence on the Pattullo and reduce the traffic load on New Westminster; just like Transport 2040, the existing New Westminster Master Transportation Plan, the Regional Growth Strategy, and the other plans we have been making for 20 years say we should. Alternately, let’s actually get ahead of those plans and reach faster for those goals they outline: take the entire $1 Billion and build sustainable infrastructure South-of-the-Fraser, and begin the orderly phasing out of the Pattullo. Posted on February 8, 2012 February 6, 2015 . by Patrick Johnstone. Leave a comment. Once again, lousy excuses for not posting more. I have opinions galore, on New West Council taking a hold-on-just-a-minute position on the Pattullo Bridge (good), on the NWEP chiming in about the Pattullo (excellent), on the Peter Kent’s continued asshattery (no longer shocking), on how some New West Rabble were perilously close to starting a grassroots “Friends of Jen Arbo” campaign, just for the fun of it (and might just yet)… and other things. But I am up to my eyeballs with this event, which I am helping organize along with being one of the speakers. I am pretty excited to be hearing Paul Anderson’s Talk. There has been so much said about Northen Gateway, It will be interesting to hear about the science of the Envrionmental Assessment. So everything else is on hold. Talk to you after the 16th. Posted on February 5, 2012 February 6, 2015 . by Patrick Johnstone. Leave a comment. If you missed the first open house for the Master Transportation Plan, or would like to arm yourself before the St. Valentines Day Messaging, the presentation materials are available on-line at the City Web Site, which provides me the opportunity to go on about some of the details therein. I am completely copying these graphics here without permission form the City, so I suggest only New Wesmtinster taxpayers, who paid for them, should click on them to see full-size versions. The fifth slide (above) provides the first really interesting data. The bar chart shows Metro Vancouver municipalities ranked by “mode share”. That is the proportion of “trips” taken by modes of transportation other than driving a car. It is pretty clear from this bar chart that New Westminster is already a regional leader in sustainable transportation, with a mode share of 36%, second only to those dirty bike-lane hugging hippies in the City of Vancouver. What I take out of that chart, though, is a demonstration that infrastructure matters. The top three Cities are those with the complete integration of the SkyTrain. The next two are also well serviced with transit, with the SeaBus an important part of their infrastructure. All of the top 5 have put serious investment into bike lanes and pedestrian amenities. They have all put an emphasis on building compact transit and pedestrian friendly town centers. What’s worse: the Mayor of Langley City, Peter Fassbender, is the vice-chair of TansLink’s Mayors Council. I’m not sure if the 9% should be more embarrassing for him, or if TransLink should be more embarrassed that he has been elevated to help lead the region in Transportation when his own City serves as cautionary example for the whole region… but as usual, I digress. The bicycling infrastructure info is actually a little disappointing. The cycling mode numbers are lower than I would expect, and the cycling network is distressingly incomplete, 13 years after the cycling plan for the City was laid out. Even the designated bike routes we have are either suffering from erosion from disregard (BC Parkway anyone? ), or are bike routes in name only, being just as unfriendly for cyclists and completely unmarked as they were 20 years ago (try to cross 20th street on the London Bikeway, I dare you). I love the topography map they have on the 10th slide. Whoever thought of that map must be a genius. It shows that most of New Westminster is not really that hilly. There are only a few areas where the slopes cause a real challenge to recreational or casual cyclists – the Downtown-Uptown link, the Brow of the Hill, and Sapperton. I hope with this Master Transportation Plan, we can re-draw the cycling map with this in mind, and find creative routes to make these slopes manageable for more cyclists. The City’s Bicycle and Pedestrian Advisory Committee already identified a route from New Westminster Station to the Saint Mary’s site that connects relatively gentle slopes with very short stretches of higher grades, with only a few missing links that need to be connected. The advantage of the current low mode share is that it should be easy to increase in the foreseeable future. Transit is a good news story for New Westminster, and a large reason why we have such impressive mode share numbers. As I said before: infrastructure matters. Five SkyTrain stations for 60,000 people is one of the remarkable advantages of being a compact City in the centre of Metro Vancouver. The problem comes down to frequency. The diagram above shows AM peak time frequency, which is pretty good. However, the City’s largest employers are not 9-to-5 mom-and-pop operations, but have a lot of shift workers. We also have a large lower-income population (due in part to our large rental property stock) who tend to also work in less traditional jobs. The reality for many people in New Westminster is that much travel for work is during off-peak times, not to mention travel for play. When transit service drops to 30-minute, or 60-minute service, it becomes completely unreliable. Especially in a place like Queensborough, where 20 minute bus service for a 15-minute ride to 22nd Street mean that it can take more than half hour at the best of times just to get to the SkyTrain Station you can see over there on the Hill. Once we hit 11:00pm, much of the transit frequency drops to zero. Of course, this is slightly out of the scope of the City’s jurisdiction. there is little the City can do but lobby TransLink to improve service. Unfortunately, we have been going the other way of late. What the City can do, however, is make sure the infrastructure on the ground is there to make using transit easier. For example, the City, as a general rule, lacks bus shelters. There are also several decisions we can make to prioritize cycling and pedestrian infrastructure improvements at vital transit links. Finally, we can (outside of the Master Transportation Plan, mind you), continue to encourage dense land use at our major transit nodes, like we have done at New Westminster Station and Sapperton Station, and are looking at for Braid Station. How long can 22nd Station be surrounded by single-family homes? Slide 16 was interesting for a few reasons. The numbers that really stood out for me were 4,300 vehicles per hour on the 4-lane Pattullo Bridge compared to 3,500 on the 4-lane Queensborough. Who would have thought the lil’ old Queensborough carried more than 80% of the traffic of the big bad Pattullo? But I also don’t understand how we can have 3,000 vehicles on both sides of the bridge, and 3,500 over it… there is something funny about where these numbers were collected and what they mean for that intersection. I suspect this also argues pretty strongly towards saving a ton of money and and replacing the Pattullo with a 4-lane structure, but another post, another time. The good movement info here is the one that has so far generated he most discussion. The City’s survey has reflected what TransLink has said all along: about 40% of New Westminster Truck traffic either starts or stops its trip in New Westminster. A few people (including Councillor Chuck Puckmayr at last week’s Committee of the Whole meeting), have questioned the methodology that resulting in the is number. I am more interested in where in the City these stops are happening – are they all going to Kruger? Are they driving across the Pattullo and through downtown on the way to Queensborough landing? Just how many semi-trailers full of food does Safeway need in a week? I really don’t know. But that kind of data might be useful. The other part of the goods movement discussion is already popping up in the local media, and that is the future of truck traffic on Royal Ave. I think the issue of directing all commercial traffic to Royal is a big one, especially as we are going to have another school built right on it. There is strong pressure right now to make Royal the truck route, which will effectively increase total truck flow through the City. I think that is a bad idea, for various reasons. But again, this is already too long a post, so I will address that another time.